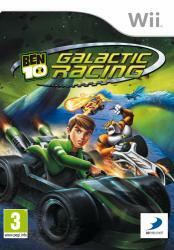 The first kart racing game set in the popular Ben 10 universe features Ben and his alien friends competing in a galactic grand prix through a variety of tracks! Race in over 30 different karts in 25 exhilarating and challenging grand prix tracks spread across 5 environmental worlds from the BEN 10 universe. 15 characters for players to race as, including heroes like Ben, Kevin and 10 of Ben�s most popular alien forms.